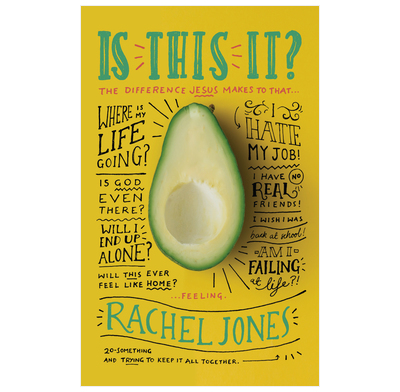 Rachel Jones is 20-something, trying to keep it together, and ready to say what we’re all thinking. Whether you’re just feeling a bit lost or having a full “quarter life crisis”, this funny, honest, hopeful book reveals the difference Jesus makes to the challenges of adulting. 1. Dissatisfied Has everyone else got it better than me? 2. Paralyzed (or maybe Indecision) What should I do with my life? 5. I hate my job I've got how long till I can retire? 8. Single Why are all my friends getting married? 9. Dating & Marriage Is this normal or have I made a huge mistake? 11. Meaningless What's the point? 12. Self-doubt What if I fail in front of everybody? 5.3" x 8.5" x 0.5"
Rachel Jones is the friend who just gets you. In Is This It?, she covers profoundly deep and impactful issues for twentysomethings with relatability, honesty, and a healthy dose of humor. This book will uncover and address some of your deepest longings, fears, and insecurities while meeting you with a firehouse of gospel grace and practical insight. I wish everyone my age could read this book! An extremely helpful and timely book for younger Christians who are trying to make sense of life and faith. As a pastor of a congregation filled with young folks going through the “quarter-life crisis,” I’m often addressing these same kinds of issues. Now, I have a resource to give to these young believers. Is This It? is rooted in the Bible, saturated with a gospel worldview, and a real pleasure to read. I wholeheartedly recommend it. In an age of Instagram comparisons and Fear-Of-Missing-Out, Rachel does an amazing job of pointing the dissatisfied back to Jesus and the satisfying truth of the Scriptures. This book will help people take their eyes off of their situation and focus instead on Jesus. It’s not just going to make you grow; it’s going to make you laugh. Found this book extremely helpful. Love the way Rachel keeps the book firmly ground in Scripture, thoughtfully weaving appropriate Bible stories/passages throughout each chapter. Plenty of personal anecdotes are used and her style is warm and engaging, with some lovely moments of human. Highly recommended! Rachel's life and her brave description of so many areas described in this book mirrors my life incredibly. This is definitely a book that needs to be read by so many young people and young adults. The idea and supposed fear of singleness, questioning the meaning of life, dissatisfaction in ones job, isolation, doubt and so much more are all topics that Rachel explores especially from her own experiences. God has used her especially to tell a story that we all need to contemplate in our lives. Read it, you won't regret it. The brilliance of Jones’s book is that unlike any other self-help book being pushed at us on social media – it’s an unashamed acknowledgement that not-so-good thoughts litter our minds during times of big changes. But, even more brilliant is Jones’s reliance on God’s Word and His purpose for our lives. There’s no better way to approach the quarter-life crisis than with Rachel Jones. Is This It? will help you navigate through all the tricky turns of millennial life, whether you are going through it yourself or know someone who is. It’s funny, compassionate and completely relatable - highly recommend.